Well, I've been absent from this thread, but have kept pretty busy! ADAMS Autosport is an actual "thing" with an actual website now (posted that thread not to long ago). More parts are in process, and more tutorials are incoming. One of the things that the car needed was a rebuilt heater core, so that was tackled over the last couple weeks. Here's a couple after shots. There is a tutorial I just finished on the website for anyone who needs it. The car is coming along as well. I just finished laying out my fitting locations for the fuel/brake lines. They need to be tacked down and covered with body sealer before the Wurth Schutz gets sprayed on. 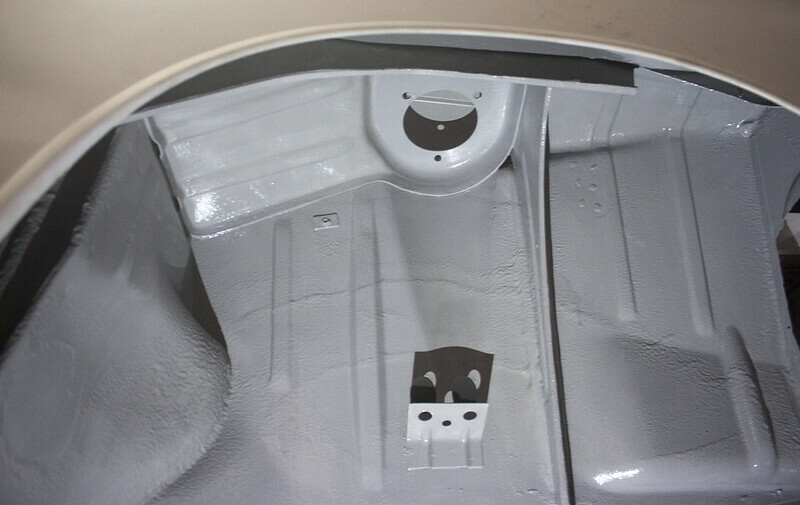 After getting a lot of input I ended up using Southern Polyurethane's epoxy primer for the interior and underbody. Taking an concours/hotrod trick, I'm brushing the stuff on. Very very impressed with SPI as a whole, it is a neat company with great quality product. whats the advantage of brushing it on instead of spraying? It allows for a little thicker coverage/protection. The dry time is longer, and the time it takes to brush it on is longer, so it isn't economical for paint shops (generally speaking). 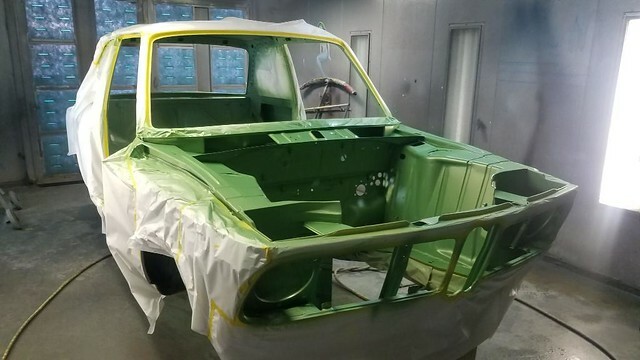 Things are moving forward, this paint prep process is taking a lot longer than anticipated (surprise surprise). With the bottom, wheel wells, and interior now painted in epoxy primer it's time to start applying the Wurth undercoating. Wurth carries their gray version again, so I got six cans to do the underside and wheel wells. First coat will be natural gray color, but for the second and third coats I'm going to try to tint the undercoating Taiga and see how it works. The spec sheet says it can be tinted up to %30, so we will see how it works out. The first coat in the wheel wells is done. However, before I start the underbody the final bit of welding needs to be done. Note the cut-out. This is wear the Oil Cooler will be mounted. Also finished the first production run of the new Internal Headlight Covers. Can't wait to see these painted! Hey - looking good, Andrew. I know that view and texture (from my Bristol car). Which Wurth product are you using? Would that wrinkle finish be appropriate for inside the trunk on the shock towers? or is it to tacky. Agh, sorry for not responding sooner Ben. I'm have used Wurth Stoneguard Grey and Black. The grey should be easier to tint with Taiga-colored paint. The actual finish texture depends on you. Lower air pressure = thicker "globs" (that's a technical term), so you can extrapolate from there. Back on page ten you can see what we did with texturing the trunk and rockers. This past Saturday I rolled the chassis closer to the welder and the last of the fabrication was finished. Namely, bolts were welded into the floor. They will act as studs for what will be the fuel/brake hardline retainer tabs. I’m using retainer tabs found on E30's/E28's for a clean setup. A couple wayward screw holes were welded closed, and the old speaker holes on the rear seat support were patched. In the engine bay, I bent up a little extra reinforcement bar and welded it into place. With that done, I used a brush and some Wurth Seam Sealer to close up the floor drain holes. Also brushed the inner front fenders, rear inner fender wells, and a couple other spots. I've been getting geared up for the colored part of the undercoating process for a while! It's the first chance at seeing some color on the car! So off to the store I went with a piece of Taiga sheet metal from a parts car. Between the sample and Taiga color code (072) the paint shop was able to mix up 2 quarts for the project. This whole experiment was a bit of a fun learning experience for me, I haven’t done any colored processes before and was a little nervous at the thought of a worst case scenario that included all $350 worth of supplies in the trash. The idea of coloring the undercoating itself is pretty straight forward. With the undercoat colored all the way through (rather than just paint over top of the coating), future chips/gouges are less likely to stand-out. Masked off the car with some riveting Spanish newspaper. All mixed up! The batches were done 2 quarts at a time. And ACTION! There was a little learning curve, the gun didn’t want to cooperate at first as the mixture was a little too thick. Once that was corrected by a little dilution, everything went great. In total the undercarriage received two-to-three-ish coats. All in, six bottles of Stoneguard were used and around a quart and a half of paint. A little color peeking through, this was a pretty involved little session, so no photos were taken of the actual work being done. I did a little touch up this morning and pulled off the masking tape! It feels fantastic to finally have some color on the car! Well, haha, we'll see. I'm just going to enjoy the bajeebus out of it. Since the car was taken to the paint shop, a lot has happened. I interviewed at least four paint shops before deciding to use RW Enterprises in Hawthorne. He painted @Schnellvintage's 2002, which turned out stunning (to the tune of winning SoCalVintage the year before last). The quality I saw on the various other cars was fantastic (he had some very nice Porsche's and restomod muscle cars inside). There was a waiting list that meant a 6 month window before he had room, small price to pay. As a fun note, his lead paint guy used to be the lead paint guy for Vector (remember them!?). Yesterday the base coat went on. 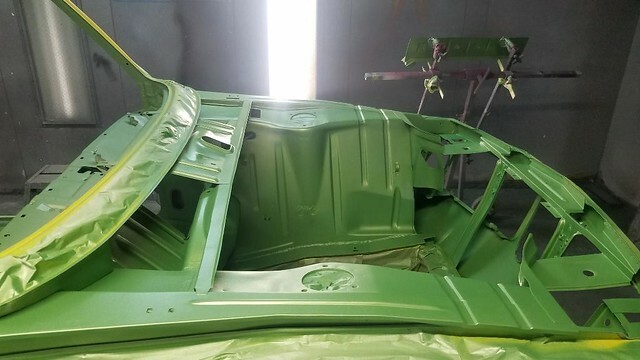 The interior will get light "overspray", similar to factory. Looks amazing !!!! Can’t wait to get my 67 1800 over there..
Oh wow, Taiga? Looks fantastic so far. *edit - missed the earlier paint post. oops. Goal: The overall goal has once again been an "OEM+" look with plenty of subtle changes. I'll be using the chrome dash from the early cars since I feel it best matches the early door panels and BMW's original design intent .... DOT regulations be d*****. It took the better part of two years to piece everything together. HUGE thanks to Fay at Jaymic for scrounging out the center ash tray and carrier. Another HUGE thanks to Jeff Chang (German Autoworks, GA) for the NOS lower dash panel. Lastly a HUGE thanks to Jake (DasFrogger) for the glove box. Here's the conversion components laid out (note that I'll be using the std. upper gauge binnacle and dash section found on the standard 3-piece dash). **Not pictured are the little plastic chrome plate retention knobs used by each chrome trim section. These were also tricky to find, but would make a great 3d-printed part! The Glove-Box restoration was first. Here's a "before" shot for posterity. If anyone has a source for those inset washers around the latch, please let me know! Unscrewed the chrome beauty strip, it had a bit of character. Rusty latch, but the vinyl was in GREAT shape. Stripped what was left of the original flocking material with a little careful acetone application. brushed on a liberal amount of the flocking "glue". Flocked! I just used a fresh black costco bin on it's side as a "spray booth". This way the excess flocking media was recaptured. The trick here is wait a minute to let the glue saturate the flocking media and "puff" on another layer of media. Once the glue no longer saturated through, we were golden. After letting the flocking material dry for a few days (and getting the latch/retainer-bar/accent-strip back from the chrome shop), I reassembled the glove box with fresh hardware. With that done, and all the other pieces NOS (already pretty), that's the majority of work needed on the conversion parts. I've often admired the VDO gauges in the E9 coupe and early Porsche's (apparently Alpina did as well) as they all have a thin chrome trim line with a textured black center. The pre-paint-prep trick is to use pin-stripping tape around the chrome trim to mask off each gauge's center section. Pin-striping tape has flex to it, making tight radius bends possible. At the end of the day, I got a pretty close match to the original satin-black texture. tip:* DON'T try and mask to the ID of the chrome lip. It's much easier (and avoids goober build up) if you paint over the chrome lip, come back and wipe it VERY carefully with an acetone-enriched cloth. However, don't "over-wipe" as you can very easily wipe off some of the main face's coloring/lettering! I learned this the hard way and had to scrap an otherwise perfect gauge face. I used Odometer Gears fresh gears and went through each of the gauges. Given the desire to keep the stock gauges while swapping in the M20, I had a problem with the tachometer not being functional. Fortunately, with with the commissioning of a fellow FAQ'er these little Tach-adapters were developed. 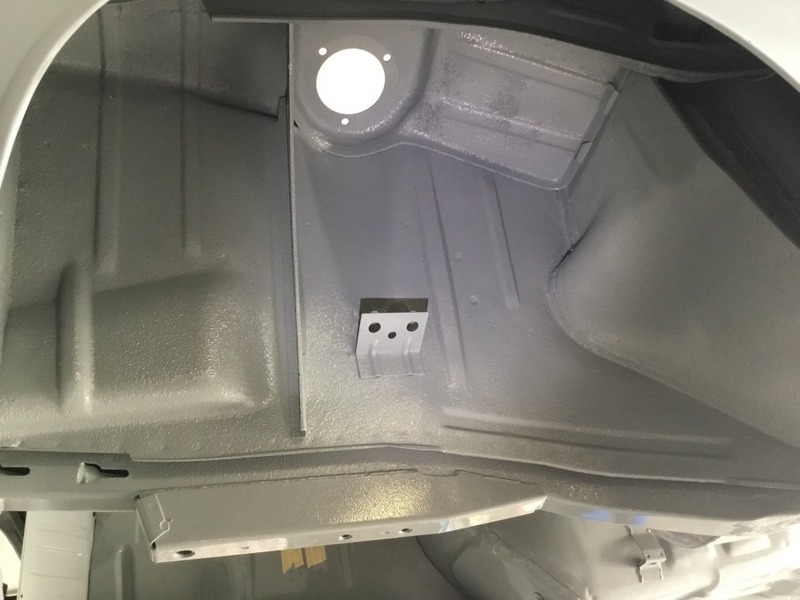 The inside of the cluster (and each gauge's interior trim ring) were masked and painted white. In preparation to painting the housing's face, I removed the outer gauge rings. these rings were VERY difficult to strip (probably the trickiest part of the whole project) as too much abrasive would cut into the plastic where as not enough left old paint stuck on. The housing face and outer rings were painted satin black. Hearkening back to my picture framing days, I cut some "museum glass" for the gauges. this stuff is rather remarkable in that cut's down nearly all reflecting light and fully protects from UV rays. It's not cheap, but I've made them available to others on the website. Lastly a set of polished trim rings were bought from Robert at Dido Tuning. The first set did not fit, but he came through with a redesigned set that worked perfect. A little bit of clear silicone was added when reinstalling the inner trim rings, which should hopefully minimize the chances of everything coming loose. Here's the cluster all assembled. This is where we're at now. Pictures will be added. Right now the cracks have been dremeled out and plastic/fg has been melted in. The goal is to re-wrap all three dash pieces with no visible seams. This part goes along with the dash repair and re-wrap. I'll be cutting holes into the dash to mount three auxiliary gauges. There are those who make an adhesive vinyl overlay for gauge faces, ya know.